For kids of a certain age, Ghostbusters was as much about cartoons as it was the movie. The Real Ghostbusters felt like a seamless extension of the big screen version—even if Egon’s hair inexplicably looked like vanilla soft serve ice cream. Phillip “Shamoozal” Summers of Nacho Punch has taken The Real Ghostbusters and crafted his own version of it in the style of ‘80s-television anime. Featuring the aesthetics and kinetic slapstick humor of the genre, the title sequence also trades in the original collection of ghosts for an ecclectic array of Japanese yōkai. 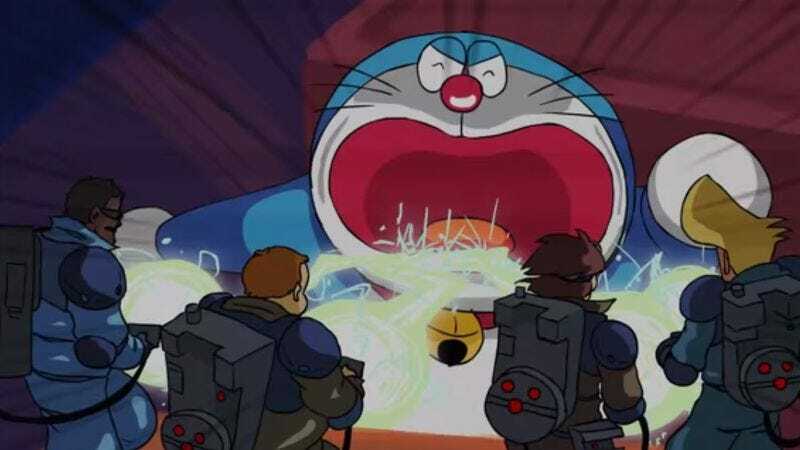 Following the credits, Summers teases us with a few frames of the team facing off against a giant Doraemon. Japan’s beloved time-traveling robot cat is also a pretty good counterpart for Mr. Stay Puft.